For one business owner, a small investment in attachments pays off big. It’s no secret that finding innovative ways to grow your business has become increasingly important in recent years. And some landscape business owners, such as Carl Williams, general manager at Lawn Sense in Monroeville, Pa., are finding compact equipment attachments to be a direct and inexpensive path to diversifying. Williams, whose business is 70 percent commercial and 30 percent residential, has expanded his business and saved money largely through two attachments—Bobcat’s Brushcat mower and Box Blade plow. 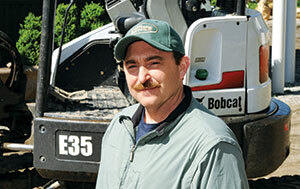 Brushcat mowing jobs have generated for Williams $20,000 to $30,000 a year, he estimates. The mower attaches directly to a skid steer or track loader. Williams’ team uses it to cut grass that hasn’t been maintained for several months, such as undeveloped parcels that need to be maintained just annually or semi-annually. “It’s for builders that may want to maintain their lots just to keep them walkable, that’s been the niche for that piece of equipment,” says Williams. Some winters, Mother Nature doesn’t bring as much snow as others. With that in mind, Williams reasons, a truck is a big investment that doesn’t provide as strong a return as a $3,000 snow pusher. While rental remains a strong alternative to ownership, an improving economy is convincing contractors to buy compact equipment again. Rental and acquisition strategies each offer unique benefits for different stages in an operation’s life cycle, and both are demonstrating positive trends. Job site conditions – Are your typical project tasks, terrain or space constraints changing enough to require a different type or size of machine than you currently operate? Project frequency – How often will a machine be used? Will the length of your contracts and the volume of work generate revenue to support a short-term payment schedule or long-term investment? Attachment versatility – Do your attachments provide flexibility, compatibility and accessibility for multiple job sites? Attachment utilization of 50 to 75 percent usually justifies a permanent fleet addition. Capital resources – Rental payments can be tax deductible, but are there greater tax incentives for purchasing? If you’re repeatedly renting a machine, but cash is tight, does a rent-to-purchase option agreement (RPO) pencil out? The decision to buy or rent entirely depends on your company’s situation, so take the time necessary to fully evaluate what is best for your operation.